Our new farm transport and work horse, we have not used our old grey Ferguson tractor on site for a couple of years now, its sat round idle and a little neglected. This is mostly due to our disdain for the compaction it causes and of course the high level of pollution from what is a very inefficient vehicle. But we still have some heavy things which need to be moved around the farm and certain heavy mechanical operations which we could use some form motor assisted machine to achieve. So to that end we have purchased a second-hand garden tractor or walk behind tractor to aid with the heavy tasks. 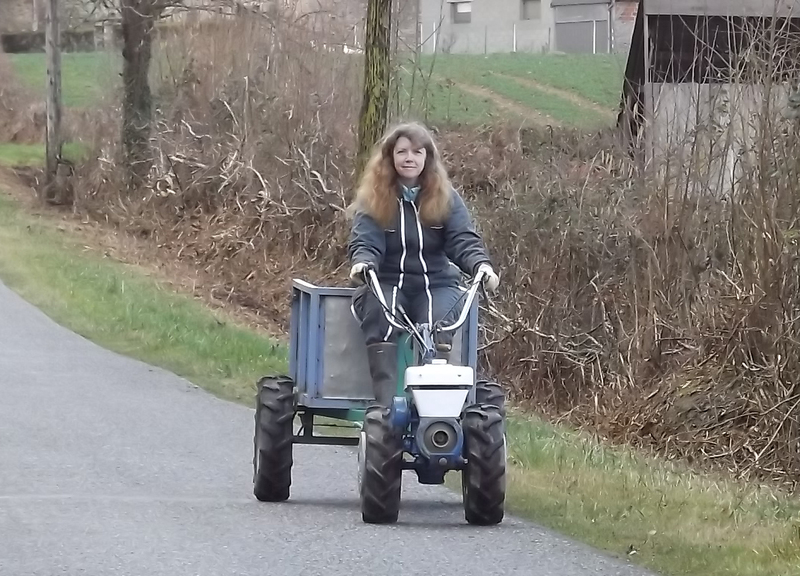 Here is Fiona aboard our newly purchased “Staub 6000” tractor and trailer racing down the road at the extraordinary speed of 4 kilometres per hour. There will be more posts featuring the tractor in the near future as we put it in to action. The tractor came with the trailer, rotavator, spring tine farrow, Canadian farrow and plough and all for just 1600€ and we searched for a Hanson scythe and found one for an additional 150€. This should help us with our challenge this year to feed ourselves entirely from our own farm. The trailer will hold about the same as three wheel barrows and should make firewood collection a whole lot easier in the coming years.